With the Dark Angels release almost upon us, I've been working on getting the last of the Dark vengeance models sorted out. Bandwagon, ho! First up is the Captain - I quite enjoyed painting this model, though it is a bit static pose-wise. Tried something new with the power sword, with a blended opposing gradient on either side of the blade. In retrospect, adding one more 'band' to the color on each side may have looked better (light-dark-light and vice versa), but overall I'm fairly pleased with how it looks! Next is the Librarian. Now that I have some high-res pics of it, there are definitely a few places I need to go back and touch up some sloppy painting - The left pauldron in particular. This is my favorite of the trio, it's just a very cool model, still a bit static, but it has a very brooding feel to it. Thirdly is the Chaplain that came in the limited edition version. Also an extremely cool model, I love the smoke effect from the vents in the backpack and all the little onyx skulls, referring to the chaplain's redeeming of the Fallen. Again, the photos betray a little sloppiness around the helmet, and the fact that I apparently totally missed painting the hoses on the sides of it. Argh! Last up are a couple units of scouts that I knocked together after a rummage around the Closet of Doom. The first of the two is the basic scout squad with the addition of a few bits from the DA upgrade frame. The second squad are built from the land speeder storm kit, which I've dubbed 'the lazy squad'. Three of them are sitting or reclining on various bits of battlefield detritus, while one is in the process of being shot. The sergeant was given a pair of wings to help tie them in thematically with the rest of the army. So far so good! Very cool man .. Scouts are looking good. nice poses .. Really makes a difference in an army. 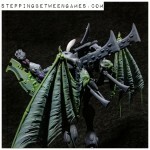 way to crank out the Dark vengeance kit! The chaplain looks very striking. My landspeeder storm scouts have been chillin' since mid 2011! How is that Scout Sergeant going to be all stealthy with that banner pole sticking up? Absolutely loving the swords on the leader and Librarian. Really cool colours. The show is stolen for me tho by your chaplain - just looks utterly bad arse. Damned fine work sir. @Zab: They definitely add a bit of movement to the otherwise fairly static standing scout models. They took a bit of cutting and tweaking but overall I'm pretty happy with 'em! @Todd Sherman: I appreciate it! I didn't want to have two squads that were exactly the same. I'll likely mix and match the models together as well so both squads have one or two differently-posed figs. @D'nyarak: The DA portion is almost done! Just the ravenwing bikers left, then I just need to knock out the Chaos Marines! @Tristan M: Nice! I like those a lot. I'd done something similar with the Storm Scouts as the basis for some guard stormtroopers a long time ago, but hadn't thought about magnetizing them for use on bases and the LSStorm. That's a great idea! Digging that Librarian, looking great! I'm really liking the shade of green you've used on the Librarian. gives the model a mystical feel. quite befitting.